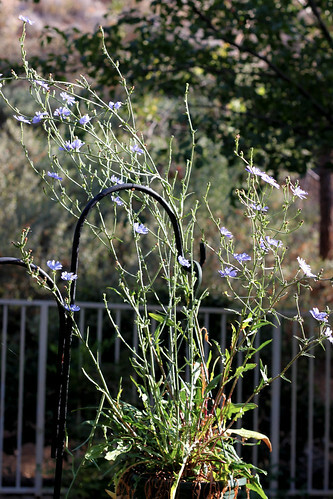 I bought this chicory plant a couple of years ago as part of a hanging basket of salad greens. I think chicory is really bitter so I don’t use the leaves. It is the same stuff that is added to coffee to reduce the effect of caffeine. I think the root is ground up for that. Well anyway, it is hot here, triple digit hot, and I went out to water really early and I thought the this plant looked so pretty. I couldn’t catch a photo of just how lacy and reflective it was in the early morning light. This plant is way too big for a hanging basket. I just like it and wanted to share. It is one of the little things that brighten my day. This entry was posted on Monday, July 20th, 2009 at 3:00 am and is filed under Garden. Tagged: Garden. You can feed this entry. You can leave a response, or trackback from your own site. 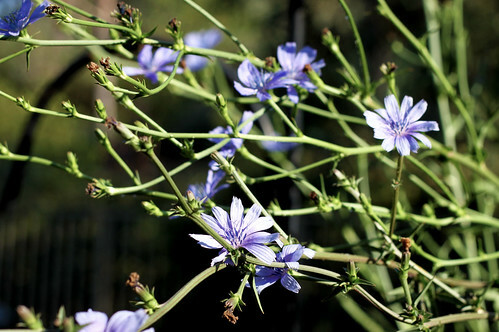 Does the chicory smell the way it tastes? (Does that make any sense?!) I never realized it was a flowering plant. It doesn’t have a fragrance. I just love the color of the delicate flowers.